With more than 50 years of pump and compressor knowledge, Thomas offers a base of air moving know-how few companies in the world can match. With a wide range of pressure, vacuum and liquid technologies including: WOB-L piston, articulated piston, diaphragm, rotary vane, linear and peristaltic, Thomas offers the broadest product range in the industry. With this vast product offering, Thomas can design an ideal, custom pressure or vacuum solution that can be prototyped and manufactured to meet our customers’ precise needs. Oil-less WOB-L piston pumps and compressors. Best choice for pressure and/or vacuum applications that require compact, lightweight designs and high performance piston seals. Oil-less articulating piston pumps and compressors. Well suited for applications that require high pressures with proportionately high flow capability. 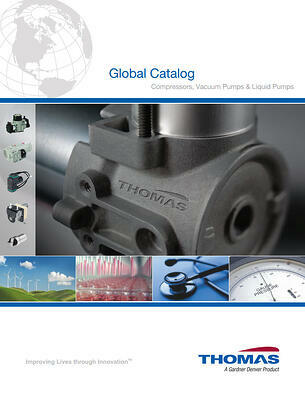 Oil-less diaphragm pumps and compressors. Durable diaphragm design provides high efficiency, low sound level and good air tightness. Adapts well to different gasses. Oil-less and self-lubricating rotary vane pumps and compressors. Low vibration, nearly pulsation free, compact and in some cases reversible flow operation. Oil-less linear diaphragm pumps and compressors. Quiet operation, lower pulsation, high efficiency and fewer wearing parts. Liquid diaphragm pumps. Self priming, dry running and suitable for continuous operation. Drive available for all required AC and DC voltages. Liquid linear diaphragm pumps. Very long life and low sound level. For applications with low pressure requirements. Liquid peristaltic pumps. Low vibration, nearly pulsation free and of compact design. Reversibile operation. Adjustable through supply voltage. Interested in a Thomas Pump? Long life and low noise are key factors to consider when selecting pumps for medical equipment. With a reputation for reliability and quiet operation, Thomas products are found in all types of equipment designed to monitor, sterilize, diagnose and analyze. Other applications assist in healing, promote patient's comfort and support life itself.